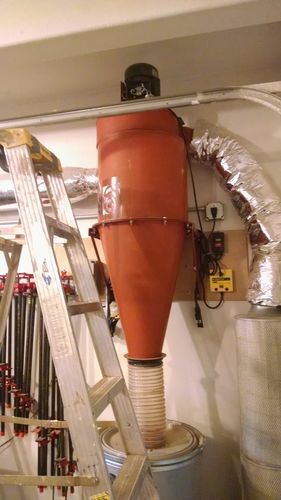 One day my Tempest cyclone dust collector wouldn’t turn on. It made some grunting noises, but never really got going. I assumed it was a start capacitor, as I’ve had that fail on other tools over time. At least I hoped that’s what was wrong. So step one was to order a new start capacitor from Grainger. The specs were 500 microfarads and 125 V. The electrical connection had to be changed from U shaped connectors to female tab connectors to fit the new capacitor. Still no big deal, but when I popped the new capacitor in, the DC still wouldn’t start. Same symptoms as before. So I thought the on/off switch may be at fault. Or perhaps my iVac pro switch was to blame. The pro switch has an internal breaker that popped if I leave it plugged in more than a couple seconds. This was happening with the old start capacitor too. To isolate the problem, I rewired the motor straight to an outlet with a 240 volt heavy duty extension cord. This bypassed the on/off switch and the iVac pro switch. I plugged in the DC, and the symptoms were the same. Humming and groaning, but it wouldn’t get up to speed. So I had effectively ruled out the switches as potential problems. Then I thought… What about the run capacitor? It was a 35 mfd 250VAC capacitor with no visible signs of damage. My digital multimeter doesn’t read mfd’s so I had to experiment. 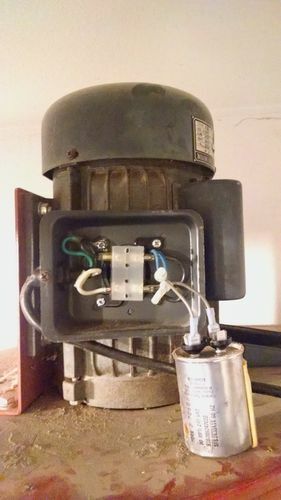 I had a matching capacitor from an old air compressor, so I popped that in the dust collector. Guess what, it fired right up. So I ordered a new run capacitor and was glad it wasn’t a blown motor. I ordered a new run capacitor for my main air compressor too. It had been acting up and popping the breaker occasionally. Hopefully the new run capacitor fixes the air compressor too. I guess my main point is… Don’t forget the run capacitor! My advise is to replace both start and run capacitors if you have an electric motor that won’t start. For whatever reason, I read the capacitor in the title as capacity. Throughout the entire post I was waiting for you to tell me that the entire cyclone was filled with chips. Oohhh yes, how one word could change the entire meaning! Funny. Willie – when it comes to motors and the start/stops and such, I’m totally illiterate. If I was writing this blog it would be “Duct Collector Won’t Run, Bought New Motor, New Starter, Now What??”. I’m not even sure I would know how to properly take a motor off and replace it. I probably would be asking one the maintenance or electricians at the plant for help. Sounds like you saved a fair amount vs. the predicament I would be in if a motor failed. Yeah, luckily it was a cheap and easy fix. Just waiting on the replacement capacitor that will fit under the cover. Nice to be in working order again! I would like to know if any Lumberjocks have ever heard/seen a capacitor explode? Having been around electronics for over 60 years; I wiil just say it’s not fun or funny when a cap of significant size blows up. I’ve seen them leak fluid, but luckily no explosions for me. Oldnovice would be in the same category as myself. A multimeter WONT check capacitors!! It will most likely measure close to the markings on the can though, if you have a “capacitor meter”. What you cannot measure is the ESR! ESR stands for “Equivalent Series Resistance” . Translated what that means is that its “guts” have failed. It hasnt broken down electrically, but all its muscles have dried out. ESR requires some pretty simple, but not really available testing apparatus. My advice it just change the capacitors ( BOTH of them). They are not expensive!!. What to look for is the correct, or very close MFD’s. Thats microfarads in long hand, it might also be marked as UFD. Voltages marked on the can is the ABSOLUTE minimum required. My own experience has been that some Asian machines will use a 125 volt start capacitor, in the position of start. In Australia we have 240 volts ( give or take) and 50 Hertz, or cycles per second. When replacing caps, ALWAYS make sure that the voltage is correct!!. 125 volt capacitors are TOO SMALL to be reliable. They can explode!! ( like a 12 guage shotgun shell in some cases), although most “modern” caps are internally fused to help prevent such incidences. These capacitors work very hard, and its fairly normal for them to fail ( takes years though). CHECK your manual about how many starts the capacitor can handle per time. BIG electric motors require very large starting currents, and can “cook” a capacitor if starting and stopping is very frequent. 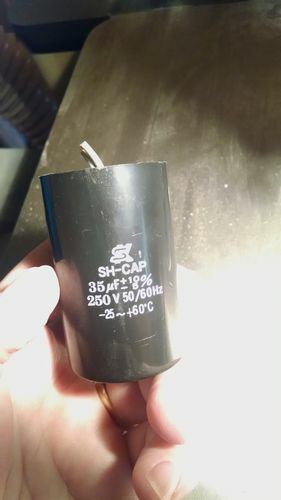 The worst I ever heard and saw was a bank of six 80,000 μF electrolytic capacitors blow, one or two at a time until all were “toast”; caused by a shorted rectifier applying AC voltage to the caps! Too bad we didn’t have cell phone cameras back then (circa 1965) it would have been a good you tube video. My bandsaw recently will hum and not go anywhere. I open the doors and turn the wheels. No problem. Try again a couple times and gets going. When it is up and running it resaws 10” hardwood no problem. What could it be?